Corcovado National Park, which covers about one third of the Osa Peninsula, is one of the country’s best natural spectacles, pristine and beautiful. Birds, mammals, insects and amphibians thrive here, in one of the world’s most bio-diverse locations. 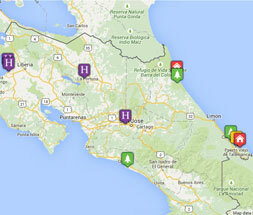 On the southern side of the Osa Peninsula is the Golfo Dulce. This 'sweet gulf’ is a home to resident bottlenose and common dolphins and is used as an annual nursery by humpback whales and their young before they embark on their long ocean voyages. The park is home to all 4 species of monkey found in Costa Rica, and all 6 of the cat species. 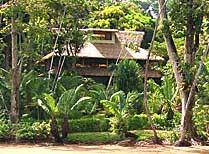 In addition, 4 species of turtle and 40 types of frog are found here. Bird enthusiasts won't be disappointed with 400 species of birds recorded here including the largest number of scarlet macaws in Central America. 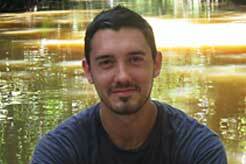 Varied vegetation includes lowland tropical rainforest, cloud forest, swamp forest and mangroves. 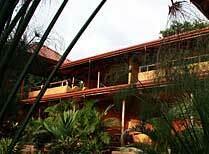 There are 39kms of beach in Corcovado. Visitors can explore on foot, by bike, horse and sea kayak. Not everyone ventures this far south, so you get some excellent wildlife viewing opportunities away from the crowds. Much of the forest surrounding the gulf is a protected area and was previously known as the Corcovado Extension or Corcovado II. In 1992 35,000 acres of this forest became the Piedras Blancas National Park, protecting some of the last remaining stretches of lowland primary forest. This is an area of incredible biodiversity. It is estimated that 750 species of trees grow here, providing habitat to 367 bird species. 140 mammal species and 117 species of reptiles have been recorded here. Much of the flora and fauna is endemic to the area. 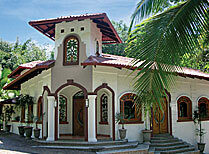 Surrounded by nature, this is an opportunity to escape the trappings of 21st Century living. Pure paradise on the Osa Peninsula. 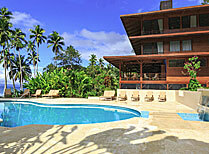 The lodge consists of attractive bungalows, 2 outdoor pools, a restaurant, bar and 170 acres of grounds near Corcovado. Accessible only by boat, this lodge has a distinct wilderness feel but your every need will be catered for. 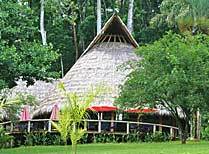 Escape all the trappings of a fast-track modern day life and get away from it all at La Leona Eco-lodge, on the Osa Peninsula. 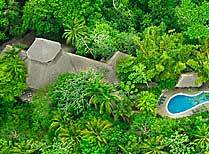 This enchanting eco-lodge occupies a prime position on the bio-diverse Osa Peninsula, close to the Corcovado National Park. 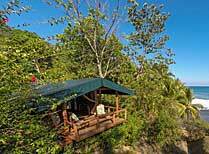 A gorgeous eco-lodge set amidst landscaped gardens at the edge of the Golfo Dulce in Piedras Blancas National Park. The flying time is about 12 hours from the UK. There are now direct flights from the UK using British Airways. We work with all the major airlines and can offer flights from the UK or via the USA, Panama or a European hub. With the connection times you are looking at around 15 or 16 hours. Not required for British travellers. Other nationalities should obtain advice from their embassy.